Book Description: Tempest Maguire wants nothing more than to surf the killer waves at her California coastline home; continue her steady relationship with her boyfriend, Mark; and take care of her brothers and surfer dad. But Tempest's mom, gone since Tempest was eleven, abandoned the family for a reason: to return to the sea where she had been born. Yes, Tempest is half mermaid, and as her seventeenth birthday approaches, she will also have to decide whether to remain on land or give herself to the ocean. Even though Tempest loves her life and family, the pull of the water is becoming increasingly insistent. So too is her attraction to Kai, a mysterious and gorgeous surfer whose uncanny abilities hint at an otherworldly identity as well. And when Tempest does finally enter the fantastical underwater world, full of mermaids, sea witches, and even her mother, she finds that a larger destiny awaits her—one that hangs the entire ocean's population in the balance. Review: Tracy Deebs' Tempest Rising entwines the normal with the extraordinary, the magical and mythical with reality. Deebs has crafted a mature yet teenage voice. I find it refreshing that Tempest doesn't want her mermaid heritage. She craves normalcy, but even she realizes no one always gets what they want. Deebs creates real and fantastical situations for her characters. The descriptions of the undersea world burst with color, beauty, and cold danger lurking in the deep depths. I loved the mythological creatures mingled with the ones we know today. Mermaids, selkies, and sea witches are believable with the sharks, octopuses, and fish. Images of a dark the Little Mermaid float to the surface. If you are looking for a paranormal romance not of the norm, I highly recommend Tempest Rising. I hope there will be another book in the works. 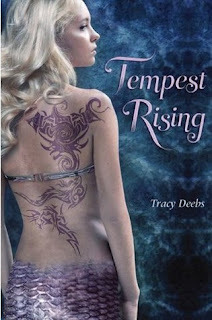 I am also giving away a copy of Tracy Deebs' Tempest Rising on my Book Reviews blog. All you have to do is click here and leave a comment. The winner will be announced on Friday. This looks good! Like the Little Mermaid backwards!